Martin’s intricate playing, unique style, and iconic solos are well known to millions of fans. Since leaving Tull (more on that later) in 2012, Martin has released four studio albums and toured the U.S and Europe regularly. Born in Birmingham, England, Martin moved to London in 1966, when he and his friend Chris Rodger auditioned for a band called “The Noblemen” that was looking saxophonists. Martin, although a flute player, learned tenor sax in two days, bluffed his way through the audition and joined the band. After changing its name to “The Motivation,” the band started backing soul artists such as the Coasters, the Drifters, and Lee Dorsey. With another name change to “The Penny Peeps,” it evolved into a blues rock band, now with Martin on lead guitar. After another name change in mid-1968 to “Gethsemane,” the band began touring throughout England with Martin on guitar and flute. That same year, Gethsemane and Jethro Tull both played a blues club in Plymouth, where Martin and (Jethro Tull founder) Ian Anderson first met. A few months later, as Gethsemane was about to call it quits due to lack of financial success, Tull manager Terry Ellis invited Martin to audition for Jethro Tull. After learning material that would eventually become Tull’s second LP, Stand Up, Martin assumed lead guitar duties and embarked on a singular and highly successful career. The current tour started on April 12 and promises to be an exhaustive, and expansive, take on Jethro Tull’s legacy. The tour will extend through the summer in Europe, where Martin mentioned that he’ll play some festival gigs before taking a six-month break. “We’ve really done a lot of US tours in the last couple of years and we’re coming back in April of next year, which isn’t that far off! But, yeah, we’re just going to take a breath because it’s been really, really hard work putting the show together,” he confessed. Speaking of gear, I was struck by Martin’s insistence on maintaining his own equipment, rather than using a guitar tech. His website features the Paul Reed Smith (PRS) guitars that Martin uses primarily, but he told me his arsenal will include a Gibson Les Paul and a Fender Strat, as well as an acoustic and mandolin. “I’m looking at them [my guitars] now, I’ve got one, two, three, I’ve got five. Part of the pleasure of playing an instrument is looking after it, maintaining it, knowing it…it’s part of the job,” Martin said. 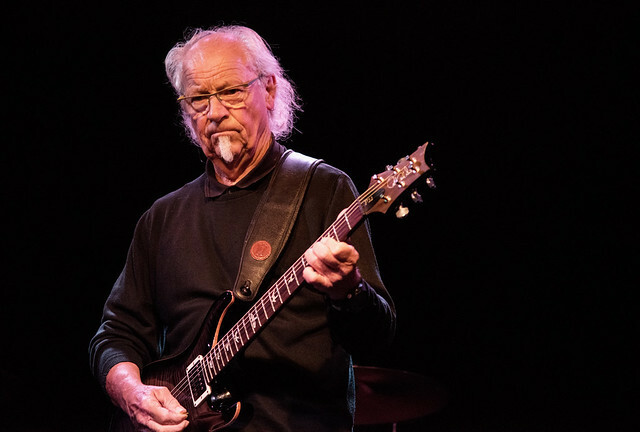 Be sure to experience Martin Barre’s extraordinary guitar work and revisit some Jethro Tull classics this coming Monday, April 22 at The Birchmere in Alexandria, Virginia, or Tuesday, April 23, at Rams Head on Stage in Annapolis, Maryland. A double live CD (one side acoustic, the other electric) from the tour will be available exclusively at the shows. Buy your tickets online for The Birchmere. Buy your tickets online for Rams Head on Stage.